A white author gets sucked into the heart of contemporary Native American life in the sparse lands of the Dakota’s by a 95-year-old Lakota elder and his side-kick. 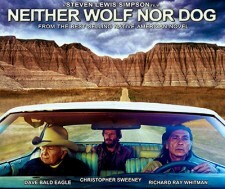 Elder, Dave Bald Eagle, stars in the hit film. Neither Wolf nor Dog, adapted from the award-winning book by Kent Nerburn. The story begins and was written in Bemidji, MN. The film has been a big hit in cinemas with a higher audience rating than any blockbuster out at the moment 4.7/5 95% on Rottentomatoes.